But oh, how beautiful she had been and was, Tristessa de St Ange, billed (do you remember?) as The most beautiful woman in the world’, who executed her symbolic autobiography in arabesques of kitsch and hyperbole yet transcended the rhetoric of vulgarity by exemplifying it with a heroic lack of compromise. I think it was Rilke who so lamented the inadequacy of our symbolism -regretted so bitterly we cannot, unlike the (was it?) Ancient Greeks, find adequate external symbols for the life within us – yes, that’s the quotation. But, no. He was wrong. Our external symbols must always express the life within us with absolute precision; how could they do otherwise, since that life has generated them? Therefore we must not blame our poor symbols if they take forms that seem trivial to us, or absurd, for the symbols themselves have no control over their own fleshly manifestations, however paltry they may be; the nature of our life alone has determined their forms. A critique of these symbols is a critique of our lives. 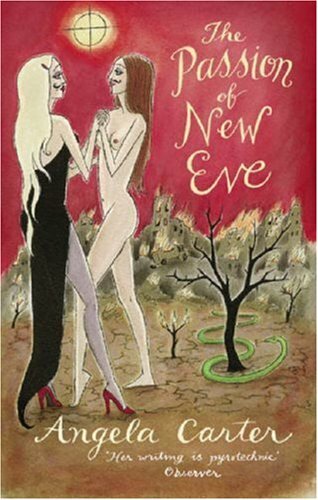 The Passion of New Eve, follows Evelyn, a young Englishman, along a journey through mythology and sexuality. It is a story of how he learns to be a woman, first in the brutal hands of Zero, the ragtime Nietzsche, then through the ancient Tristessa, the beautiful ghost of Hollywood past.